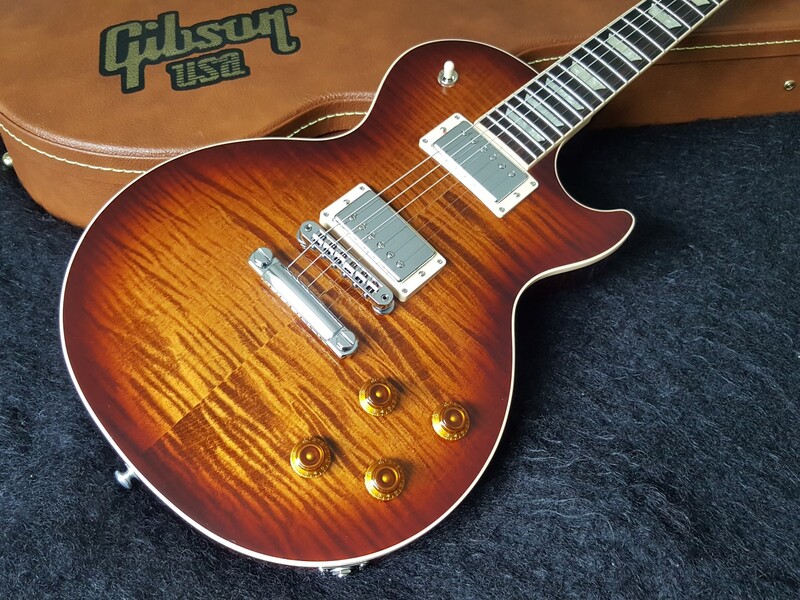 Brand new 2017 Gibson Les Paul Standard T - Bourbon Burst. Mint, not been played in a retail store, still in a box. The 2017 Les Paul Standard T's premium features, such as the modern weight-relieved body still packs ample sustain. The mahogany neck sports the SlimTaper profile and compound-radius rosewood fretboard for fast and fluid fretwork. And with the Gibson Les Paul Standard T's dual Burstbucker Pro pickups with coil tapping, phase reversal, and pure bypass, you'll have all the guitar tones you'll need. This Les Paul Standard 2017 T feels fast and precise, thanks in large part to Plek processing. Typically reserved for top-dollar custom guitars, this process levels the frets with pinpoint precision, providing you with the most playable fretboard you're likely to own. Early Les Pauls are glorious, but they are also oftentimes very heavy. Gibson has done something special with this Les Paul Standard 2017 T. It features their Ultra-modern weight-relief design that retains the chime and resonance of vintage Les Pauls with a big reduction in weight. It features a compound-radius fretboard for fantastic playability. The fingerboard features a standard Gibson 10" radius near the nut for a familiar feel that offers easy chording and rhythm playing. As you move up the fretboard, it gradually flattens out to a 16" radius. When it comes to capturing that classic Les Paul tone, nothing beats the sound of this Les Paul Standard 2017 T's PAF-style Burstbucker humbucking pickups. You'll love the tight low end, complex midrange, and sweet highs you'll get out of these pickups. And for more tonal flexibility than ever, the Les Paul Standard 2017 T sports coil-tapping, phase-reversal, and pure-bypass electronics, all at the touch of a push-pull knob.